Your shadowrunner has more safehouses than a slumlord, more false identities than a schizophrenic and a criminal record that takes up more memory than a Black Hammer utility. So were do you keep track of all that info? 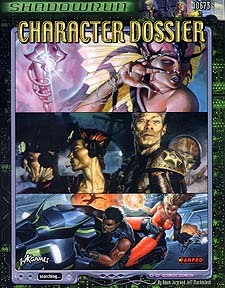 The Shadowrun Character Dossier provides 16 pages to record all of your character's details, from skills to implants to spells. All of the archetypes are covered, from adepts to riggers to otaku, and space in included for edges and flaws, Karma expenditures, character background and more. The Dossier also features handy reference table to make combat, skill use and healing run more smoothly. Store your runner's info here and put Mr. Johnson's files to shame!